For ten days in May, a Facebook “bug” changed the default privacy settings of new posts for as many as 14 million users, Recode reports. As a result, posts meant to be shared privately may have instead been shared publicly. 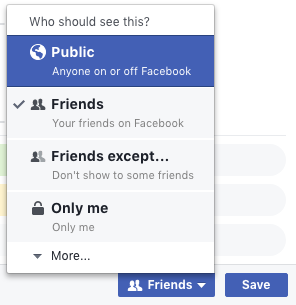 Typically, users can opt to make all their Facebook posts private, meaning only certain friends can see them. For these users, each post they write is by default not shared publicly, unless they individually choose to do so. For ten days, however, a bug caused the privacy settings for individual posts to default to public. While the affected users could individually change the settings for each post to private before publishing, users who had opted into more private sharing settings may not have noticed their default settings had changed. Facebook says it’s since fixed the bug. According to CNN Money, affected users will begin receiving notifications on Thursday. In the notification, Facebook says it has changed the settings of individual posts shared during the ten-day period back to users’ original preferences. Users can review each of the posts published during the time period, but of course, they can’t do anything about the time during which they may have been inadvertently made public.